The Cross is universal pair of fitover glasses. The design of the frame makes it ideal to wear over most normal frames. The added side protection contributes to the high level of protection these glasses offer. The big and well-formed frame ensures a perfectly even distribution of the weight and the highest level of comfort. The Delta offers the highest level of protection for the eyes. 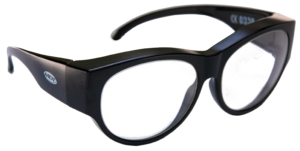 The durable frame is suited for intensive use and is to be used as a normal pair or as fitover glasses.